The Federal Emergency Management Agency (FEMA) hereby gives notice to the public of its intent to reimburse eligible applicants for eligible costs to repair and/or replace facilities damaged by severe storms and flooding (FEMA-4408-DR-PA) occurring from August 10 through 15, 2018. This notice applies to the Public Assistance (PA) and Hazard Mitigation Grant (HMGP) programs implemented under the authority of the Robert T. Stafford Disaster Relief and Emergency Assistance Act, 42 U.S.C. §§ 5121-5206. 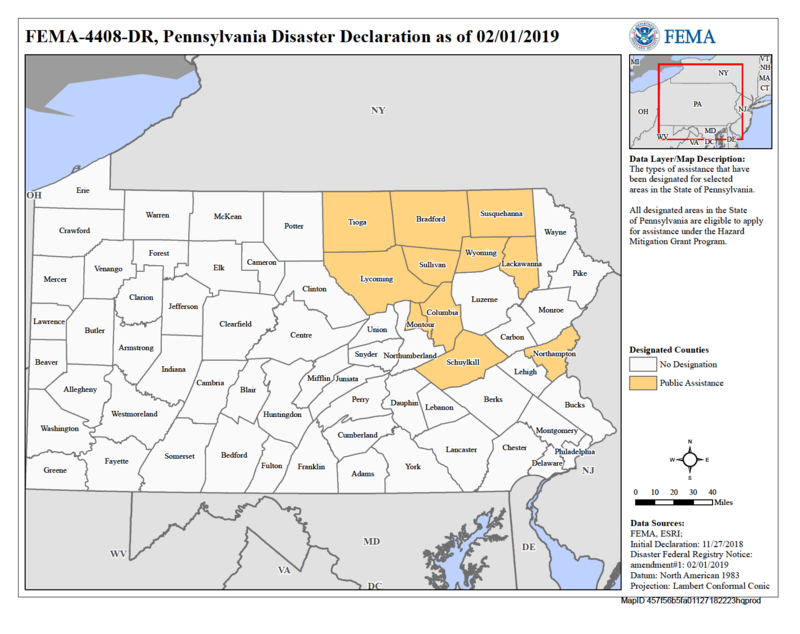 Under a major disaster declaration (FEMA-4408-DR-PA) signed by the President on November 27, 2018, the following counties have been designated adversely affected by the disaster and eligible PA only: Bradford, Columbia, Lackawanna, Lycoming, Montour, Schuylkill, Sullivan, Susquehanna, Tioga and Wyoming. Northampton County was designated on February 1, 2019. Additional counties may be designated at a later date. All counties in the Commonwealth of Pennsylvania are eligible for HMGP. In many cases, an applicant may have started facility restoration before federal involvement. Even if the facility must undergo detailed review and analysis of alternate locations, FEMA will fund eligible restoration at the original location if the facility is functionally dependent on its floodplain location (e.g., bridges and flood control facilities), or the project facilitates an open space use, or the facility is an integral part of a larger network that is impractical or uneconomical to relocate, such as a road. In such cases, FEMA must also examine the possible effects of not restoring the facility, minimize floodplain/wetland impacts, and determine both that an overriding public need for the facility clearly outweighs the Executive Order requirements to avoid the floodplain/wetland, and that the site is the only practicable alternative. Commonwealth and local officials will confirm to FEMA that proposed actions comply with all applicable State and local floodplain management and wetland protection requirements. FEMA also intends to provide HMGP funding to the Commonwealth of Pennsylvania to mitigate future disaster damages. These projects may include construction of new facilities, modification of existing, undamaged facilities, relocation of facilities out of floodplains, demolition of structures, or other types of projects to mitigate future disaster damages. In the course of developing project proposals, subsequent public notices will be published if necessary, as more specific information becomes available. As noted, this may be the only public notice regarding the above-described actions under the PA and HMGP programs. Interested persons may obtain information about these actions or a specific project by writing to the Federal Emergency Management Agency, Joint Field Office, 2570 Interstate Drive, Harrisburg, PA 17119 or by email: FEMA-R3-EHP-PublicComment@fema.dhs.gov.